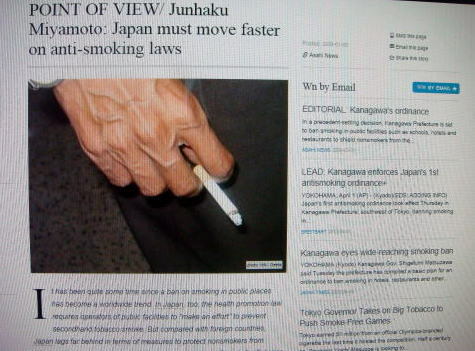 Japan must move faster on anti-smoking law / Point of View /Junhaku Miyamoto. comparison and determined that Japan ranks at the lowest level among industrialized countries. Meanwhile, Kanagawa Prefecture plans to establish an ordinance to prevent secondhand smoke. establishments to face financial difficulties. nonsmokers who had been forced to inhale secondhand smoke. The effectiveness is clear. delay legislation to enforce measures to prevent secondhand smoke in public places. country where regulations on outdoor smoking are tighter than on indoor smoking. smoking while discussing politics in those rooms are distributed across the world by the media. that is devoted not to disseminate the harmful effects of second-hand and third-hand tobacco smoke. The article was written by Junhaku Miyamoto, M.D., PhD. This international newspaper was first read by the writer at Bangkok, Thailand. The opinions are displayed on the Internet in USA, as of September 2014. 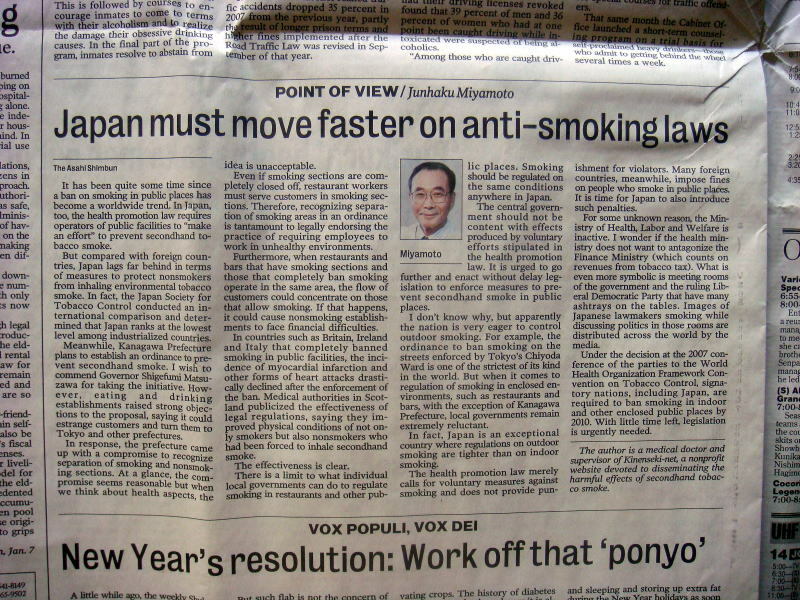 Governor Shigefumi Matsuzawa stressed the need to provide a separate indoor smoking room in public places. This ordinance has directed the whole Japan to the wrong way of smoking control.